We received the same set of Readeez that you will be able to win. We were not compensated in any other way for our reviews and the opinions are 100% our own. The last product in the Back to School Spree week is Readeez! Kids loves Readeez. I love Readeez. 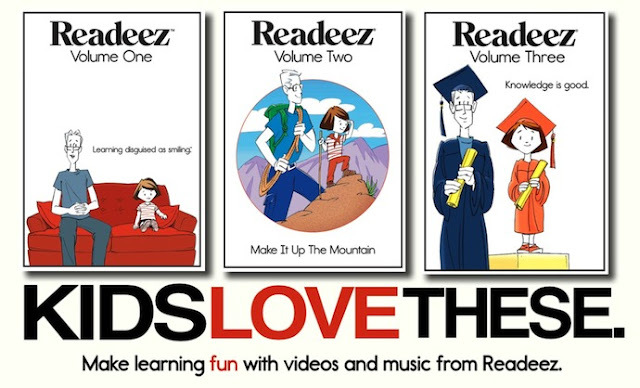 You will love Readeez, too! Somethings come in my email or in my mailbox and they are so bad I am beside myself because it is so bad. I also feel if you don't have anything nice to say, you should say nothing. Unless of course it is so horribly awful that it begs to be written about then all bets are off. The thing is, I don't have time to waste on writing about something that is crappy. I have twitter for that. I don't waste blog space on bad reviews. Period. Why am I telling you this after a week of awesome reviews? Because, I am going to love the heck out of Readeez and since I have no cute video or pictures to show you of how much my kids have been enjoying the Readeez DVD and CD set, I have to do a whole lot of talking typing. I just got Readeez in the mail on Wednesday and the kids have been watching them while I am at work since then. We have also been listening to the CD in the car. They are hooked. The lyrics and music are catchy and fun. The videos are clean and the best part... the kids are learning while watching! Or in the words of the creator, "Learning disguised as smiling." Such an amazing concept, simple, but amazing. My son hates reading. Hard to believe since I am a big reader but since he was a baby he struggled to stay still while listening to a story. It is no surprise to me that he is struggling now with reading. What he has no problem with is music and art. The Readeez series combines the two. Music that is enjoyable, paired with images that are clean and not ridiculously obtrusive and the words are popping on the screen in a fun way. Similar to flash cards but way better. There is music and cartoons with the flashing words. It is forcing him to read and have fun - at the same time! Words really are the stars! I have complete faith that one, if not both kids, will benefit greatly from these awesome DVDs and CD. As an added bonus, I won't be throwing the TV out the window after listening to them for a month.